Ochazuke (お茶漬け) is a green-tea-poured rice bowl with ingredients. It is very popular food for a bottle-ache or the last food commonly eaten at Izakaya. There are many kinds of Ochazuke. Sake-Chazuke made from salmon, Ume-Chazuke made from Japanese plum, and Tarako-Chazuke made from cod roe are most popular Ochazuke. - Cod roe for Tarako-Chazuke. 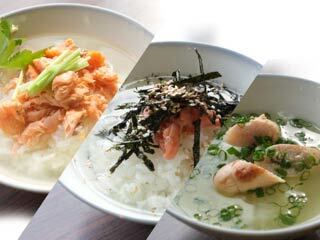 - Salted Salmon for Sake-Chazuke. - For topping: Nori, the seaweed. This time we use a oven grill. Next, cut small green onion to Koguchi-giri (5mm wide). Use only upper half of green onion. Next cut Mitsuba to 3cm wide. It is nice crunchy and gives nice smell. We use the leaves for its decoration. Use scissors to cut Nori into fine pieces. Next break Salmon into flakes. Remove the born of salmon and peel off the skin. Let's make a tea for Ochazuke. Add about 10g of green tea into Japanese tea pot. Pour boild water. This is sencha, so boiled water is good. But, don't use boiled water for other kinds of Japanese tea. Put a cover, and wait for a little moment. Prepare a bowl with rice. Then, put Salmon on the top of rice. Then, pour tea over them. At last, put little Wasabi. Then, break them into flakes. Next, put Umeboshi flakes over rice. Pour green tea over them. Pour a tea until 80% of rice soaked. Slice cod roe at a slant to make it into small pieces. Then, put sliced cod roe over rice. Then, pour green tea over them.